So my weekend was not just quilty but also productive on a every day life level. When I finally got home I setup my workstation for my quilty weekend and loafed around a while. Real work started on Sunday.. 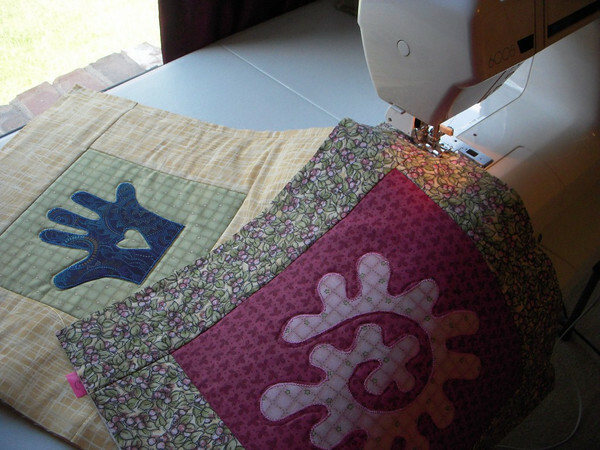 I had decided to work on my rag quilt which promised to give me the immediate gratification of getting it finished. 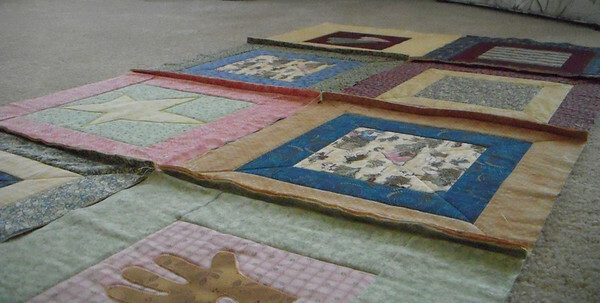 I started off with my blocks all quilted (I had done this a few weeks ago) so it was just a matter of sewing them together and then cutting up the seams to get them raggedy after washing. I used little post it tabs (you can see it on the below picture - it's fushia) on the first block of each row to keep the rows in order. I found it to be a time saver because I don't have to keep going back to look at my block placement and wonder if that was the color alignment I found to be the most agreeable. When I finally got all the pieces together I still was not finished but I was able to see how big it was and how it would look. I spent about an hour clipping the seams between the blocks and by the end I had grooves in my fingers. I think this was the worst part of the project. I think I would need to get some special scissors if I decide to make more of them. I then shook the heck out of it, banged it against the doors and threw it in the wash.
An here is the final product. The quilt ended up being about 62" x 78". It's a very nice size. 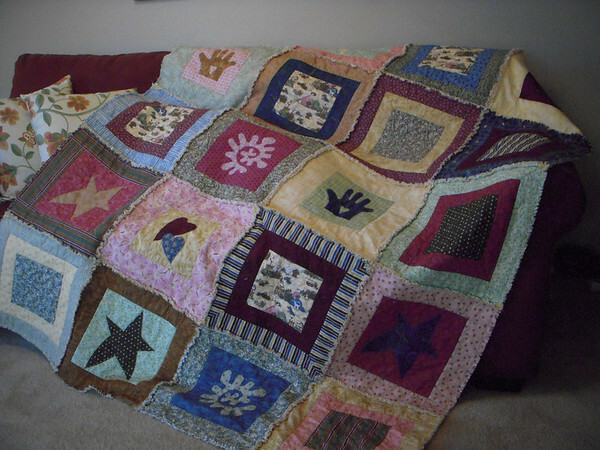 The backing is made out of flannel which is a sweet treat to cuddle under it. 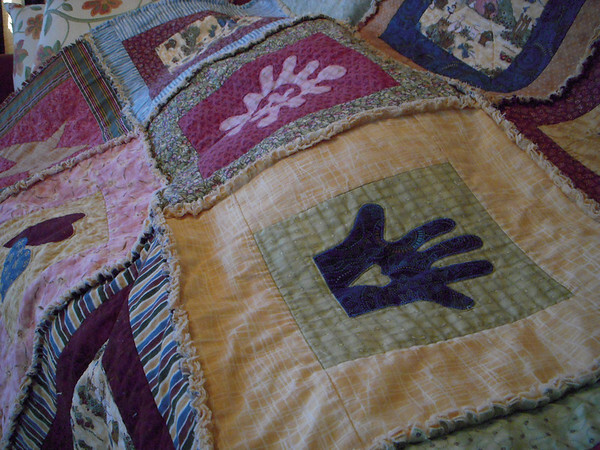 While this was washing, I decided to pick up my room (the fringing of the quilt caused lots of threads to fall all over the place) and took on a task I had been putting aside for a few years. I had a corner of my room that had my quilting accessories piled in a hap hazard mess that made my room look shabbby regard less of how much cleaning took place. I decided to find the pile of nothings a new home in my closet. I also shredded a ton of old bills that did not fit into my filing cabinet and I can finially see the rug in that corner of the room. This was done just in time to welcome my daughter back home (she arrives on Tuesday). Not too bad for a weekend! How was your weekend??? 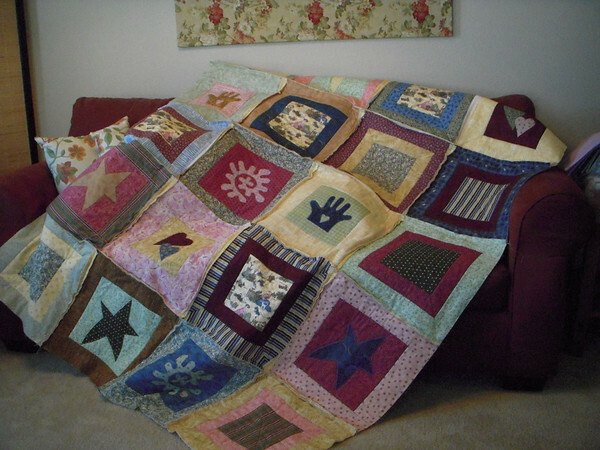 2 comments on "Putting it all Together"
When should I expect the quilt? Will it be wrapped and placed under the Xmas Tree??? Or maybe you feel a little attached??? I can do rent to own, LOL! It looks awesome and I'm thinking I could use it right about now. Oh wait, I think I read we're having temps in the high 60's today! And you have a new car? What's up with that? You're just spoiled rotten. You didn't need AC. You know how many calories you were burning up while sweating your way home? DUH! Now you'll have to find other ways of "sweatin' to the oldies, LOL! Sorry girl, this one is an overdue birthday present. Better luck next time.